Seibertron.com exclusive pics! The set of Transformers 4 took over the McCormick Place Square and S Martin Luther King Jr Drive on Friday, August 23rd on the first day of Transformers 4 filming in Chicago, Illinois. 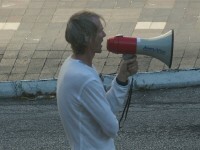 Michael Bay was seen throughout the afternoon directing plenty of extras. The area had been converted to look like part of Hong Kong. Michael Bay is the big star of the pictures in this gallery. None of the big name actors were seen on set nor were any of the Transformers vehicles. However, it's still an interesting look at what appears to be a group of people running from a Transformer amidst the "Hong Kong" set. The attention to detail to make this look like part of Hong Kong is very impressive. Enjoy this exclusive gallery by clicking here or by clicking on any of the images below. Make sure you check back throughout this weekend to see if we were able to obtain any other images from this weekend's filming. "Hong Kong Opera"? No such thing. Only "Cantonese Opera". Some advertisements are hilarious. "Zhou Ha Ya"? It's not the correct way to pronounce it in Cantonese (or even Huayu). Also, even Chinese don't know what "Zhou Ha Ya" means. The ad of the seafood company? OMG the slogans look stupid. Even slogans from the cheapest ads in Hong Kong are better than that. I don't think the crew choose the correct car model for taxis in Hong Kong. It appears a bit too long. Chinese typo mistake found on the "No parking" sign. It is ridiculous to show "Conference Center Conference Center" on the huge stands, no matter the words are written in Chinese nor English. Some more errors which are not shown by now, etc. I think Hong Kong people will be pissed off when they watch this film. The scenes are unrealistic and still far away from the real places in Hong Kong. The frequent use of Simplified Chinese characters may even enrages Hong Kong people as they're highly worried of their traditional cultures, including their language, being invaded by CCP (a lot of Hong Kong people believe that CCP is invading Hong Kong by many ways, for example, tourism, policies, education, cultures, etc.). If the crew want to produce a realistic scene of Hong Kong, I suggest to film in Hong Kong instead of that unrealistic "mix of Hong Kong / China" scene. P.S. To me, the Hong Kong scenes in Pacific Rim look like a bit Chinatown (a common mistake of Western film involving scenes of Hong Kong? ), and not to mention those Chinese grammatical mistakes. The Chinese translation of "taxi" is also missing the last half--"tik" instead of "tik see". BTW, that Zhou Ha Ya thing on the door looks more like Zhou Hei Ya...which doesn't make any more sense that the former. Zhou Black Duck? WTF? The "Zhou" in the ad can mean "week" or a Chinese surname (according to Wikipedia). However, if it means the surname, it should not be written "Zhou" (Huayu pronunciation) in Hong Kong, it should be "Chow", "Chau" or "Chou" (Cantonese pronunciation). It's uncommon to use Huayu pronunciation of the brand's Chinese name as its English name in Hong Kong. Another "fake Hong Kong" fail! Yeah, I gotta agree with the criticisms here. 1) Why not take out some human characters (or remove a superfluous chase, boom, "BB noooo! I LOVE YOU!!!" scene)? Take that extra budget and film the damn movie in Hong Kong! Like the previous posters said, Chinese people can tell the difference. How is this a good move for impressing Chinese audiences? 2) Chicago is a very SPACIOUS city compared to places like Hong Kong. You just can't narrow the streets physically to make up for that. And all the stupid ads? It looks like cheap wallpaper to make an ugly room more homey. I haven't been to Hong Kong, but I wouldn't go to Chicago and say, "Hey! This is like Hong Kong! But no Chinese ads!" 3) I was going to complain about the demographics they have as Asians, but then I remembered how the USA has a large Asian population to dip into. However, it's an entirely different matter if Bay casted actual Chinese versus other Asians. "Korean, Japanese, Chinese... same thing, right? They all look like orientals to me! HYUCK! " This is going to be one of those things. One of those things were a lot of unintended insult will be hurled at China, and China (as a whole) will blame the ignorance on all of America. Just once, it'd be nice for a foreign audience to be media literate and say, "Hey, this Michael Bay is a d*ck. Not only does he fake China BADLY, but he makes all Americans look bad, too." Chicago Tribune's Luis Gomez reached out to us here at Seibertron.com to let us know that a video from yesterday's events were posted on the Tribune's website. You can view the embedded video below or view the entire Tribune article by clicking here to view the About Last Night column titled "'Transformers' returns to Chicago with explosions". As the Tribune's nightlife columnist, Luis Gomez interviews celebrities, covers movie premieres and Chicago-related entertainment news and attends parties and club openings. We hope to hear more from Luis over the course of the next year. In addition to the About Last Night article above, Luis Gomez added several short clips to his YouTube account which you can view below. Metrosuplex wrote: Yeah, I gotta agree with the criticisms here. I have to disagree. Outside of people who live or work in Chicago and Washington, D.C., what percentage of people watching Transformers 3 Dark of the Moon knew that Sam's apartment was actually in Chicago even though fictionally in the movie it was in D.C. or that the highway chase scenes outside of Washington, D.C. was actually the Chicago Skyway (or at the very least the Indiana toll road)? My point being that this is really common in films and as a U.S. citizen, I really like that this effort is being made to keep business here in America and keep American actors employed (especially with all that they did in Detroit which really needs stuff like this). I'll side with both parties on this one. However, when you go and try mimicking something half-way around the world that looks nothing like what you have in your own backyard, you better do a ton of homework first so as you don't piss off an entire nation. That's just common courtesy (which is NOT very common these days AT ALL) and simple respect. I don't think Bay is really doing anything to worsen the rest of the planets opinion of Americans being stupid, ignorant, disrespectful a**holes. We've pretty much already cemented that opinion ourselves into the minds of the rest of the world and even being an American myself, I really can't argue with it. We genuinely DO have some of the dumbest, most narrow minded idiots on the entire planet living here and sadly, we allow them to leave our borders and inflict their stupidity on the rest of the world. I think you guys are blowing all of the Hong Kong stuff WAY out of proportion. I could care less if a movie filmed in another country inaccurately portrays America in a set and I wouldn't be surprised if most residents of Hong Kong felt the same way. Seibertron wrote: I think you guys are blowing all of the Hong Kong stuff WAY out of proportion. I could care less if a movie filmed in another country inaccurately portrays America in a set and I wouldn't be surprised if most residents of Hong Kong felt the same way. Those that do really have bigger issues and would have been better off putting the money spent on a movie ticket towards seeing a good therapist. I still stand by original assessment of Americans though, even if it is just a stereotype. It's a well deserved one. I stand by what I said but after looking for images of Hong Kong Taxis, this misspelling seems like a very silly error/oversight to say the least. Hopefully minor errors like this are corrected elsewhere in the film. i completely agree.. i really couldn't care less if hong kong looks like the real hong kong or not. plus.. generally in more modern cities there are places in every city that looks extremely similar to another city.. even if it's in a different country. in addition, i was an extra for rotf.. the "paris" cafe scene with sams parents was filmed in the courtyard of city hall.. i don't remember anyone even noticing the difference in that scene. i mean.. it's basically an enclosed area that they made look like a street corner cafe. i have no doubt that they'd be able to make anywhere look enough like hong kong that no one will be distracted during the movie. I don't mind about filming in the USA for providing jobs to Americans, but the crew really need to work more hard on the researching. The errors found in the Hong Kong scene are very ridiculous and off the charts, which make the scene unreal. The (mis)use of Simplified Chinese characters on many public places in the scene makes the problem even worse, as Hong Kong people are sensitive of the use of Simplified Chinese (SC) characters (only use for tourism information for PRC tourists) and Traditional Chinese (TC) characters (official character set used in Hong Kong) in public areas of Hong Kong. Many companies in Hong Kong are criticized by using SC characters instead of TC characters publicly, which worry the locals that those companies serve PRC tourists and don't welcome the locals (PRC tourists are also criticized of having bad etiquette, for example, seeing Hong Kong people as their slaves and allowing their kids pooing on the streets and inside the trains, but not in the toilets, which greatly annoys Hong Kong people). If the crew want to make a realistic scene of Hong Kong, please, use Traditional Chinese characters in every place, completely. Don't mix TC & SC characters together because it makes the scene unreal . Wouldn't it be cheaper to load a private plane with camera equipment, fly to China, and take advantage of cheap labor ??? A dollar goes a lot farther in China than it does in Chicago. 5,458 pages were recently viewed by 1,086 unique visitors. This page was viewed 1 times on Sunday, April 21st 2019 11:55am CDT. © 2019 Seibertron, Inc. DBA Seibertron.com. All Rights Reserved. Established June 2000. Seibertron.com is owned by Ryan Yzquierdo.